The best destination to turn your passion into success, your pathway to a rewarding future after your GCE A/L. Harness your passion to add value to the world. 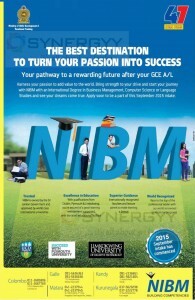 Bring strength to your drive and start your journey with NIBM with an International Degree in Business Management, Computer Science or Language Studies and see your dreams come true. Apply soon to be a part of this September 2015 intake.